In a hitherto overlooked paper, a new species belonging to the Spiraxidae is described from Mexico. Guillarmodia by its smaller size and distinctive subsutural striations. The new species is described from an area where the topography facilitates ecological isolation and fragmentation of habitats. For that reason it would be good if this fauna is evaluated from a conservasion viewpoint. Correa-Sandoval, A. et al., 2017. 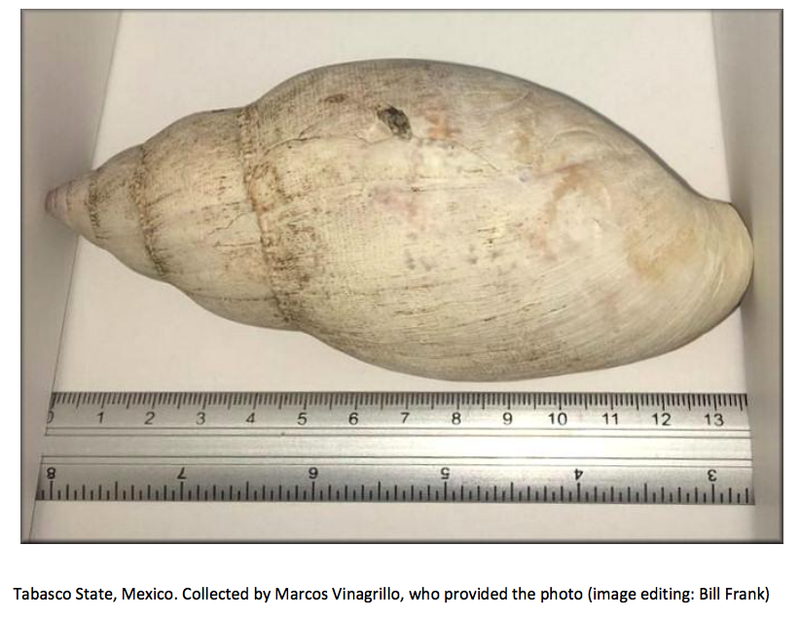 A new species of the genus Guillarmodia (Mollusca: Gastropoda: Pulmonata: Spiraxidae) from northeastern Mexico. – Acta Zoologica Mexicana Nueva Serie, 33 (3): 450-453. This entry was posted in Uncategorized and tagged literature, mexico, spiraxidae, types on September 20, 2018 by bramb. 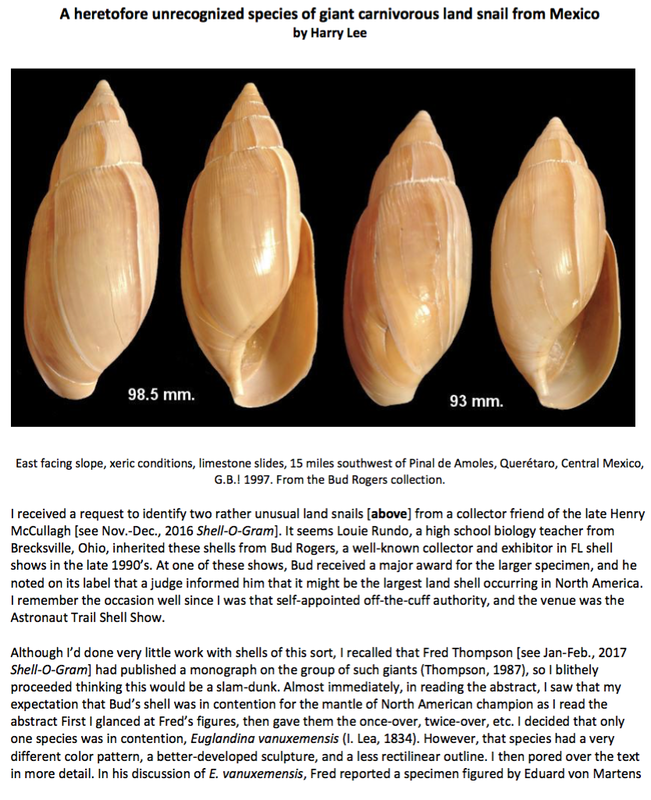 Harry Lee was kind enough to send me a copy of the journal of the Jacksonville Shell Club, with a paper on a giant carnivorous snail from Central Mexico. As this journal may be hard to find, I copy his contribution entirely. His paper appeared in The Shell-O-Gram 58 (2) with date March-April 2017. This entry was posted in Uncategorized and tagged literature, mexico, spiraxidae on March 30, 2017 by bramb. Published just before the end of the year, Gargominy & Muratov described three new land snails from French Guiana; one of these species is placed in a new genus. This is the first paper on the malacofauna of this country after the recent revision of Massemin et al. (2009), in which the first author covered the land snails. 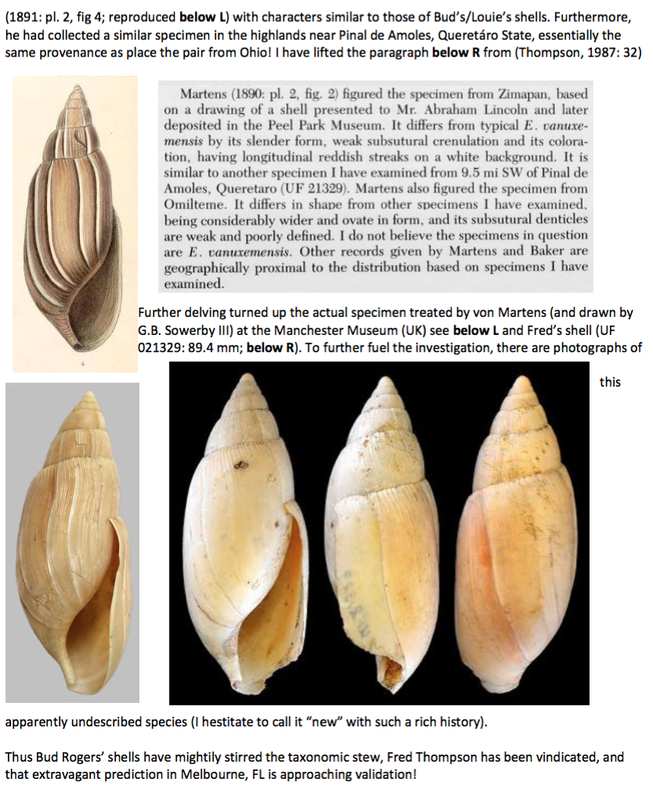 Material obtained from sieved leaf litter and soil collected during 1997 and 1999 yielded three new species so far; however, many of the micromolluscs then collected prove to be new to science but still await description. More papers are thus to be expected. 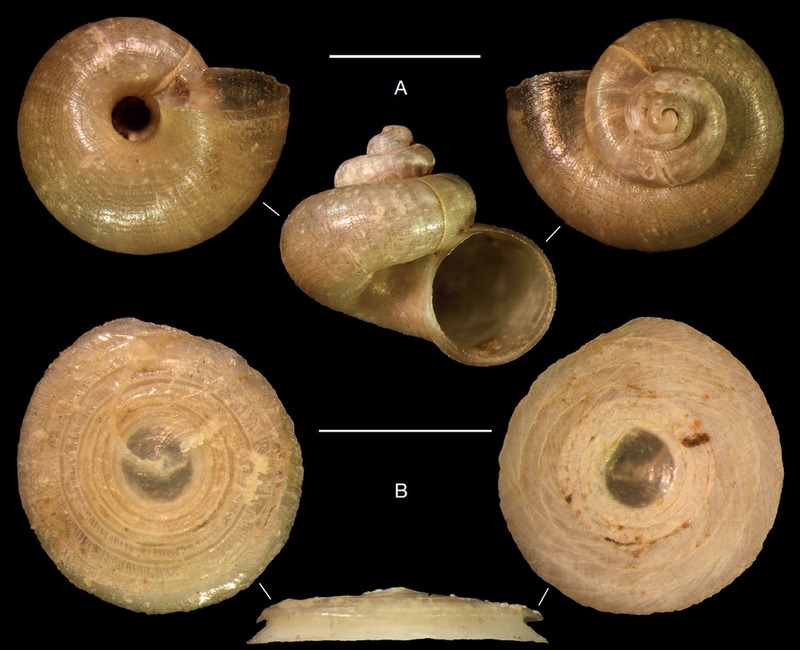 Three new species and a new genus of terrestrial gastropods are described from the Reserve naturelle des Nouragues in French Guiana. 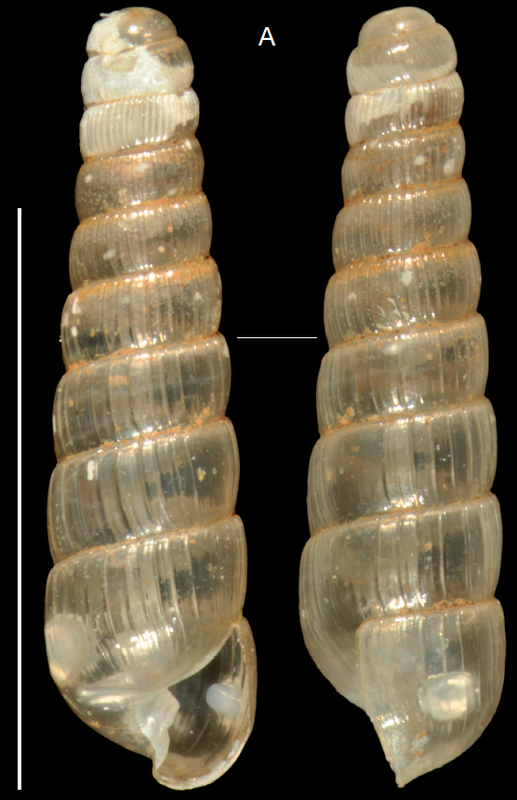 Cyclopedus anselini n. gen., n. sp. (forming new monotypical genus in the family Neocyclotidae Kobelt & M? ?llendorff, 1897) seems to be the smallest known cyclophoroid in the western hemisphere. The descriptions of the other two new species, Pseudosubulina theoripkeni n. sp. and P. nouraguensis n. sp., from the family Spiraxidae Baker, 1939, extend not only our knowledge of the geographical distribution of Pseudosubulina Strebel & Pfeffer, 1882 (previously known with certainty from Mexico only) but also the diagnosis of this genus, which now includes species with large penial stimulator and apertural dentition. Cyclopedus anselini n. gen., n. sp. Gargominy, O. & Muratov, I., 2012. New taxa of land snails from French Guiana. – Zoosystema 34: 783-792. This entry was posted in Uncategorized and tagged frenchguyane, literature, neocyclotidae, spiraxidae, taxonomy on January 2, 2013 by bramb.